Memorial Brick project is located at Hamilton Park, Bond House area, at the corners of East Main St, Meriden Rd and Silver Street. 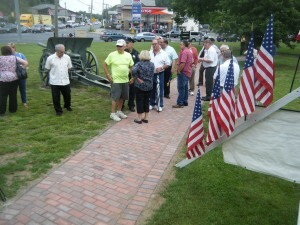 Sales are on going–to date there are over 100 bricks in the Place of Honor and over 90 bricks in the Walk of Pride. An additional ten brick will be place before Father’s Day.